Welcome to Canada’s largest Curtain Rod Installers listings website. We strive to provide you with the most complete list of drapery hardware installers in Canada. We welcome all curtain installers in Canada to contact us and become members of our drapery installers listing. We are looking for curtain rods installers with experience, and preferably a portfolio of your previous drapery installations. If you are located in Toronto, Mississauga, Montreal, Vancouver, Quebec, Victoria, Ottawa, Brampton, Edmonton, Calgary, Saskatoon, or anywhere else in Canada, send us your company details and we will gladly add you to our website for free. This company is the highest rated window treatment company in Ontario, based on their review rating across the various web review portals. Based on the analysis of customer reviews we have found that this window treatment store is the preferred choice for residents of the Greater Toronto Area. Address: 1015 Matheson Blvd. E. Mississauga ON L4W 3A4. Services: Specializing strictly in window treatments including the design, manufacturing and installation of drapes and blinds. This store has over 100,000 fabrics to choose from for your curtains making them also one of the largest fabric selections in the province of Ontario. 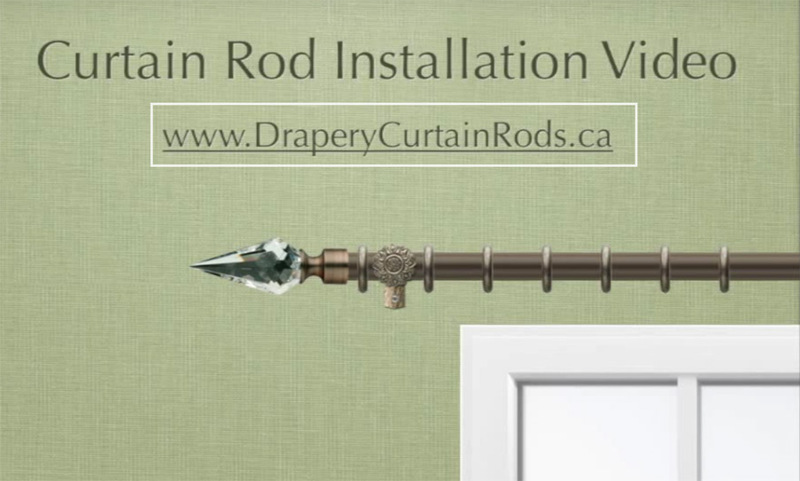 Drapery Curtain Rods is Canada’s largest online retailer of decorative curtain rods. If you are looking to purchase top quality decorative curtain rods and hardware in Canada then your best bet is to buy them from www.draperycurtainrods.ca. This online drapery hardware store has some of the most beautiful drapery rods, finials and holdbacks at prices other curtain rod stores can not match. Their drapery rods website is very easy to use and their images are real size and high definition so you can see exactly what you are buying. They carry iron curtain rods, wood curtain rods, bay window curtain rods, long curtain rods and just about any other curtain rods you can imagine. This company is Toronto’s largest drapery installation company. They service the entire Greater Toronto Area (GTA). Based on an evaluation on their reviews they are one of the top ranked installers in the Country. They not only install to the end consumer, but they work with interior designers and large companies to complete large commercial projects. If you are looking for a highly specialized drapery installer as opposed to a general handyman, this company is the best bet. We are here to help you select the most reputable drapery installer in your area in Canada. We evaluate each drapery installer in detail to determine if they know their stuff. At Drapery Installers Canada we are also drapery installers with many years of experience, so we know what to look for. We will audit each curtain installer in order to filter out all the installers lacking knowledge and experience.